Is it time to ditch IE 6? A few weeks ago, 37signals brought up a great question -- one that was echoed by a friend of mine just a couple of days ago: When can we finally ditch IE 6? A few notable companies are taking the first steps. 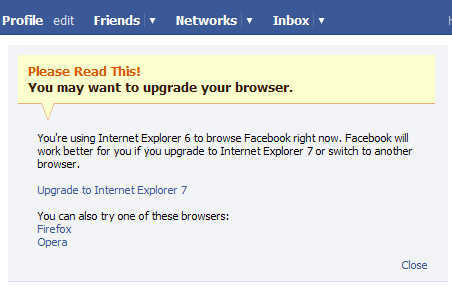 Facebook has been warning users about the perils of using IE for a while. And now it looks like Apple's newest web apps won't be supporting IE 6 at all. Frankly, I'm not surprised. I think they are taking a necessary step forward by forcing users to use a modern web browser. After all, it is 2008, not 1996. At some point, support for IE 6 in rich web applications becomes a time- and money-wasting monster. Even with the best front-end developers on a project, its massive laundry list of bugs and shortcomings are a burden. When it comes to supporting modern web technologies like Ajax to simple PNG and CSS, IE 6 can't hang (tell me something I don't know, right?). There are a couple deciding factors in making a decision to drop support for IE 6. To me the biggest one is your audience. Before making the jump, ask yourself a few questions about your users: How old are they? How are they getting to your site? What percentage of your current users are using IE? Are they experienced web users? These should be relatively straight forward questions since you should know your audience better than anyone. We, as web designers and developers, have a responsibility to gently nudge IE 6 users toward more modern browsers. And before we totally abandon them, let's give them options. Sites like savethedevelopers.org are a great start. After all, according to the W3C, 27 percent of all internet users are still rolling with IE 6. The day we can finally wave goodbye to our ankle-biting friend we never wanted will be a good one. That day is rapidly approaching, but in the meantime, we ultimately must be considerate to our core user base.